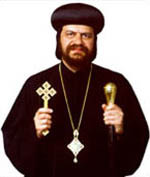 His Eminence Metropolitan Serapion was born on November 10th, 1951. After attending the Medical School at Assiut University, His Eminence graduated in 1976 and practiced medicine for a few years. Later, he joined the Monastery of St. Pishoy in Wadi El-Natroun Valley in Egypt and was consecrated as monk on August 6th, 1979. He was ordained as a priest on July 18th, 1981 at El-Sourian Monastery. Then H.H. Pope Shenouda III sent him to serve the Coptic community in Switzerland, and he served there from December 23rd, 1983 to June 1985. June 2nd, 1985, he was ordained as a Bishop for the Bishopric of Public, Ecumenical, and Social Services at St. Mark Cathedral in Cairo. Ten years later, on November 14th, 1995, His Eminence was called to be the Bishop of the Diocese of Los Angeles and Southern California, and was later enthroned as the Bishop of the Diocese of Los Angeles on December 23rd, 1995 at Holy Virgin Mary Church in Los Angeles.